Includes one Alien Invader Halloween wall art decoration of an alien face. Measures 13" tall by 9" wide. Colored as pictured. 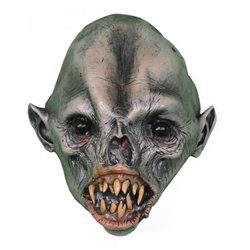 The alien invader wall art Halloween decoration is a quick and easy way to turn your home into a haunted house or alien spaceship for Halloween by creating the look of a creepy alien head mounted to the wall.